As La. 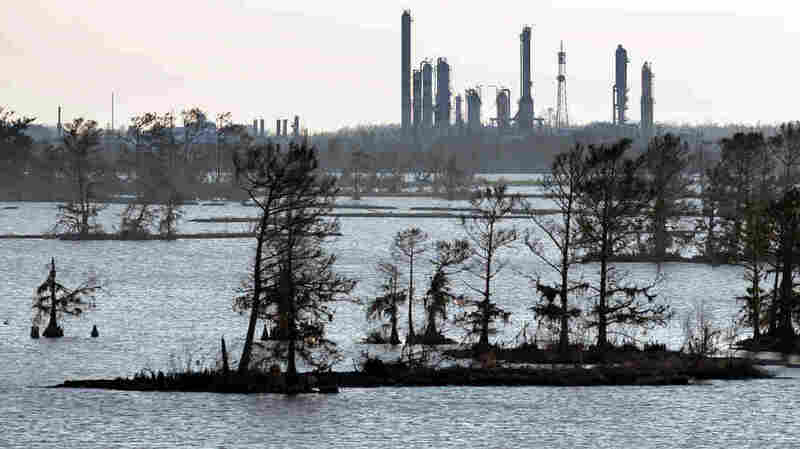 Coast Recedes, Battle Rages Over Who Should Pay A flood protection authority is suing to try to hold the oil and gas industries responsible for Louisiana's land crisis. But policymakers are trying to stop the lawsuit, saying it's bad for business. Historian John Barry pushed a lawsuit alleging that oil and gas companies destroyed land that once served as a buffer protecting New Orleans from hurricanes. Louisiana's coast is disappearing at the rate of about a football field an hour. Since the 1930s, the Gulf of Mexico has swallowed up an area the size of Delaware. You can see the water encroaching in Delacroix in St. Bernard Parish, less than an hour southeast of New Orleans. Here, a narrow crescent of land known locally as the "end of the world" is where the road abruptly comes to a dead end; in the distance, you see the tops of now-submerged trees. "It's hard to imagine if the coast continues to erode and enormous amounts of money are not invested in protecting it, that New Orleans could survive," says historian John Barry. Barry is known for his book Rising Tide, about the 1927 Mississippi River flood. Most recently, he was vice president of the Southeast Louisiana Flood Protection Authority-East and pushed a lawsuit alleging that oil and gas companies destroyed land that once served as a buffer protecting New Orleans from hurricanes. "The loss of this land has increased the storm surge on the flood protection authority's property — the levees — and made our burden much greater," he says. The authority is responsible for maintaining an elaborate new levee system built after Hurricane Katrina, an endeavor expected to cost about $40 million a year. And it's not the only one looking for energy companies to pay up: Two Louisiana parishes are also suing for coastal restoration. The litigious environment discourages business investment, says Gifford Briggs, vice president of the Louisiana Oil and Gas Association. "That's sending a message to the oil and gas industry that if you want to operate in Louisiana, you have to be prepared to be sued," Briggs says. He rejects claims that companies are to blame for about a third of Louisiana's land loss because of the canals they cut through wetlands. "In the '60s and '70s, when we were doing exploration in coastal Louisiana, we had to create canals. So from a standpoint of land loss, it's clear that when you dig a canal or create a canal, that there's land lost," he says. "But being responsible for the coastal erosion side of it, that's not something we feel like we're responsible for." Briggs says the reason Louisiana has a coastal land crisis is not oil and gas activity, but the way the Mississippi River has been controlled by the federal government. Flood protection systems prevent sediment from flowing downstream to replenish the Delta. "Trying to blame us for something that is really the responsibility of the Army Corps of Engineers is really nothing more than just a money grab," Briggs says. Man-made canals built for the oil and gas industry cut through wetland. The industry argues those canals aren't to blame for coastal erosion. Somebody should pay, says Stephen Estopinal, current vice president of the Southeast Louisiana Flood Protection Authority-East. He says the courtroom is the logical place to decide who should pay what. "You bring 'em in the court, and let's have the court decide. That is the conservative thing to do," Estopinal says. "The liberal thing to do would be to have Uncle Sam come in and make it all better." 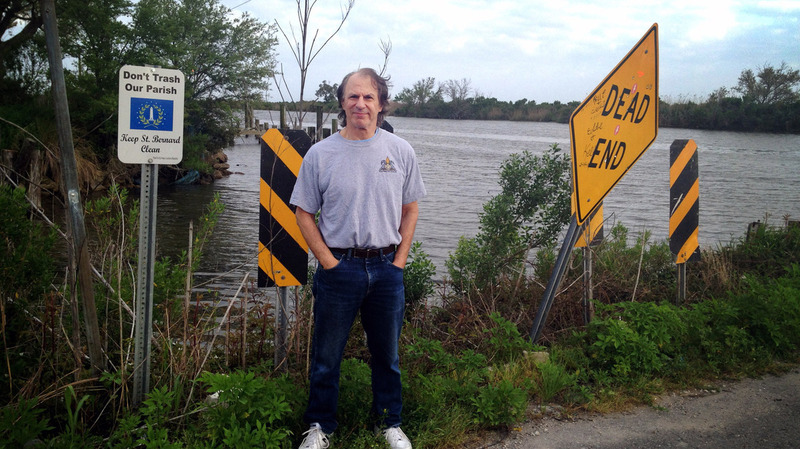 Estopinal is a surveyor and civil engineer from St. Bernard Parish, and has measured firsthand the disappearing coast. He says he's not out to cast oil companies as the lone villain. "I don't want the oil and gas industry to take the whole bullet, because they're a very important industry. I like gas in my car. I also like to have a home to go back to," he says. "We're not talking about inconvenience, we're not talking about the little birdies, or how nice things looked before and how bad they look now. We're talking about survival." The prospect of a legal fight has sparked an epic political battle in Baton Rouge. Republican Gov. Bobby Jindal and state GOP leaders are pushing bills to retroactively quash the lawsuits. Oil and gas severance taxes make up about 10 percent of the state's general fund budget. State Senate transportation committee Chairman Robert Adley worked most of his career in the oil and gas business. He says it is bad policy to target a key industry that had permission from the state to develop its natural resources. "I don't believe that anyone ought to be sued or exploited for doing what they were told to do," Adley says. "Now, it's easy to argue about the big bad oil companies and that kind of thing, but the truth of the matter is, we as a people, we want what they have." Proponents of the lawsuits say it's the other way around. "Oil companies can't leave Louisiana. We've got what they want," says Democrat Foster Campbell, a public service commissioner. "Here we have in Louisiana for years and years and years kowtowed to the oil companies under the threat we will leave Louisiana. They're not leaving Louisiana. We're where the oil is. We're where the gas is. We're where the delivery system is for America." And America needs what Louisiana has. The question is just who should pay to keep Louisiana intact.